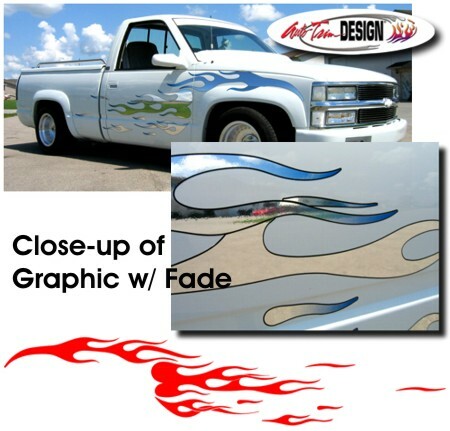 Customize your ride with this awesome Flames Graphic kit! Graphic set comes as a sixteen (16) piece kit for both the Driver and Passenger sides. Available in a wide variety of colors, you can even add an outline and fade to the tips in the colors that we have available. Graphics in the picture consist of a Chrome Foil base with a Black Outline and Electric Blue fade at the tips. While the graphics are shown on a '88-'99 body style Chevrolet Silverado, these graphics will fit a wide variety of vehicle types. Very little trimming required. Please Note: Fade and Outline option is only available on the following base vinyl colors: White, Black, Bright Yellow, Tangerine, Red (031), Silver Metallic, Bright Gold Metallic and Chrome Foil. As an extra step, graphics that include the Fade Color and Outline option are capped off with a clear high-gloss protective lamination that'll protect the graphics for year's to come.